It’s time for another reader question from Satori’s Facebook page, and this time it’s all about small laundry room organization. I admit Heather’s subject line “Please Help My Laundry Room!” immediately caught my attention. It’s one of my favorite rooms to organize and make pretty and, needless to say, I jumped at this chance. Please Help My Laundry Room! To give you an idea of Heather’s laundry room, it has a single bulb in the center of the ceiling as the only source of light (except for one small basement window), there are no storage cabinets or shelving, and the current paint color is a medium-toned tan. The flooring is beige linoleum that is in good condition, but looks dated (she doesn’t want to replace it at this time). 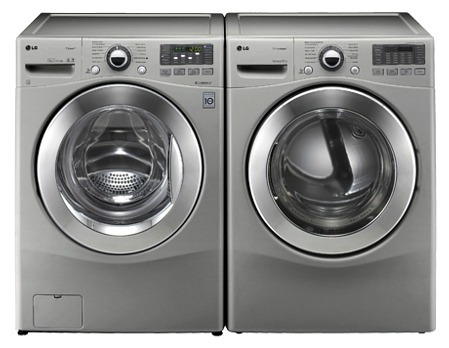 These are the gorgeous LG washer and dryer they recently splurged on. To start with, I suggest painting the walls a spa-like color, such as Benjamin Moore’s Tranquility (AF-490). It will lighten up the space and give it a fresh and clean laundry feel. Next, I’d paint the floor. 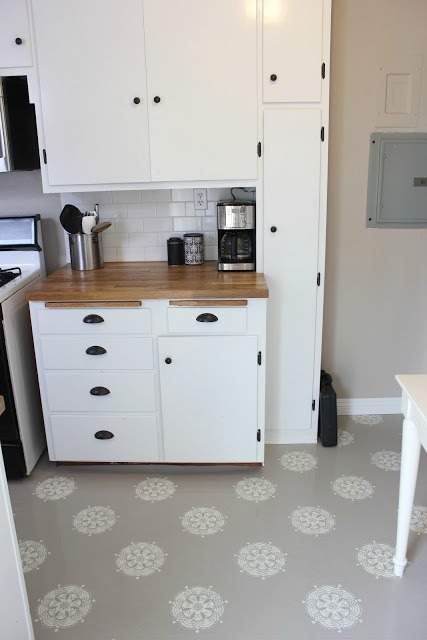 A checkerboard, wide stripe pattern, or bold stencil will add some fun to the space and make the linoleum look less dated. Try Benjamin Moore’s Metropolitan and a soft white for contrast. To maximize folding room, install a countertop over the washer and dryer, spanning the entire length of the wall. This will give you ample room for folding, plus additional room for laundry supplies. 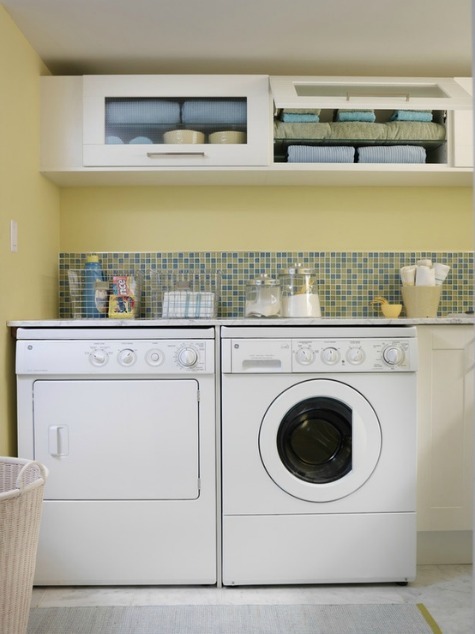 For additional storage, install cabinets above the washer and dryer. These lift-up cabinets used in one of Sarah Richardson’s laundry room designs are very functional and relatively inexpensive. To address the piles of laundry on the floor, consider using vertical space like this laundry sorting station created by Kim of Sand and Sisal. For added style and texture, consider swapping these conventional laundry baskets with lined woven baskets. Change out the light fixture to something that is pretty with at least two bulbs for brighter lighting. For a bit of fun you could add a pop of color like this yellow drum shade Jen from IHeart Organizing installed in her laundry room. 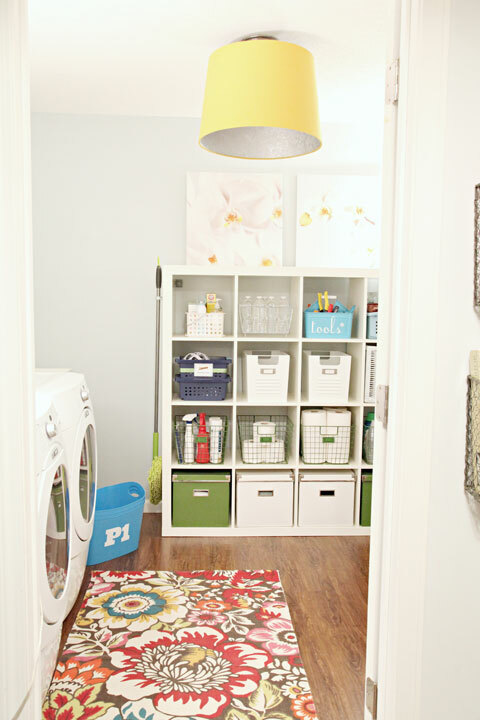 Finally, add some laundry storage containers and decorative touches to make your room sparkle. Thanks for writing in, Heather. 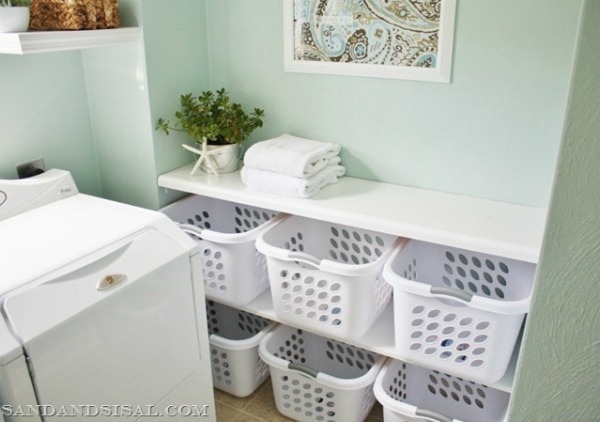 I hope these small laundry room ideas help. Be sure to keep us updated on your progress! If you have a decor, design or organizing question you could really use help with, follow the Satori Facebook Page to find out when the next open call for questions is. If it’s something you can’t wait on, be sure to check out my design and organizing services, including e-design. You can check out past reader questions here. Wonderful advice as always! I think you addressed all of her issues! I love the paint color you suggested for her wall. And the yellow shade is fab! ….love the fun rug in the room from I Heart Organizing.